A tower in St Patrick`s Church commemorates the centenary of the discovery of Patricks Plains in 1820. The foundation stone for the tower was laid on the 21st March 1920 by the Bishop of Maitland. The name Saint Patrick’s Plains was bestowed upon the area possibly by John Howe, the leader of the party which first reached it in 1819 and 1820. Howe’s first expedition crossed the mountains from Windsor and arrived at the river (which was the Hunter) near the present-day Jerry’s Plains. The following year with a larger group, he used a modified and somewhat easier route, and on 15th March 1820 arrived at the river downstream at Whittingham, close to the present site of Singleton. 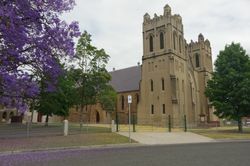 An important event in the life of the Catholic community of Singleton was fulfilled on Sunday, when the extensions and improvements to St. Patrick's Church were solemnly consecrated by the Bishop of Maitland (the Right Rev. Dr. Dwyer). The necessity for more accommodation had been felt for several years and at last it was deemed imperative to either erect a new church or make additions to the old edifice. A meeting of parishioners was held on Sunday, June 8, 1919, when it was decided to make extensions to the church. Plans were drawn by Mr.T. W. Silk, architect, and tenders were called for the work. The local contractors, Messrs. L. Hinde and, A. Bruderlin, were the successful tenderers and the work was commenced about December 1919. The foundation-stone was laid on March 20, 1920, by the Bishop of Maitland. Owing to unavoidable delays the work has just been completed but it has been faithfully performed, and in its new form the church takes a prominent place in local architecture. 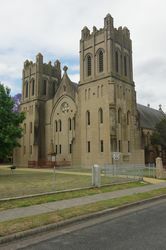 The extension adds another 30 feet to the church, and is flanked by two massive towers, one of which is in commemoration of the centenary of the discovery of Patrick Plains on March 17, 1820, and the other in memory of the Catholic men of the parish killed at the war. The Maitland Weekly Mercury (NSW), 10 December 1921. And in memory of the discovery of Patrick Plains on Friday 17th March 1820. 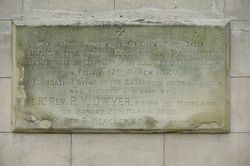 The foundation stone of the extension of this church was blessed and laid by the Rt. Rev. P. V. Dwyer, Bishop of Maitland, on Sunday 21st March 1920.